‘From the bowl to the soul’ is the new Wagamama marketing strap-line. The brand believe in nourishing the body, mind and soul and are proud to currently be supporting mental health charity, mind. It’s a perfect fit for the brand as their wholesome tasty food inspired from asian fusion flavours ticks so many boxes for promoting well being. 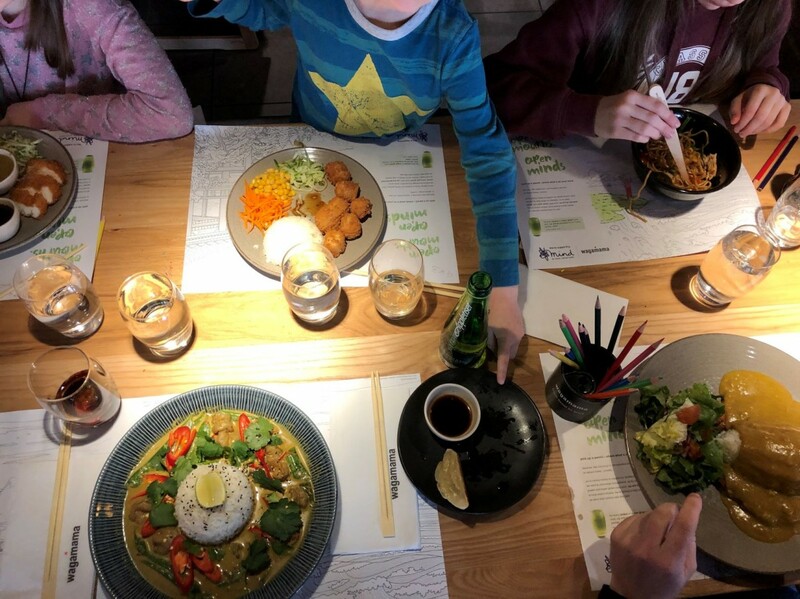 As a family we do really love Wagamama there’s always something for everyone and I love how we all end up choosing something completely different that suits us individually whilst all sharing the same meal! 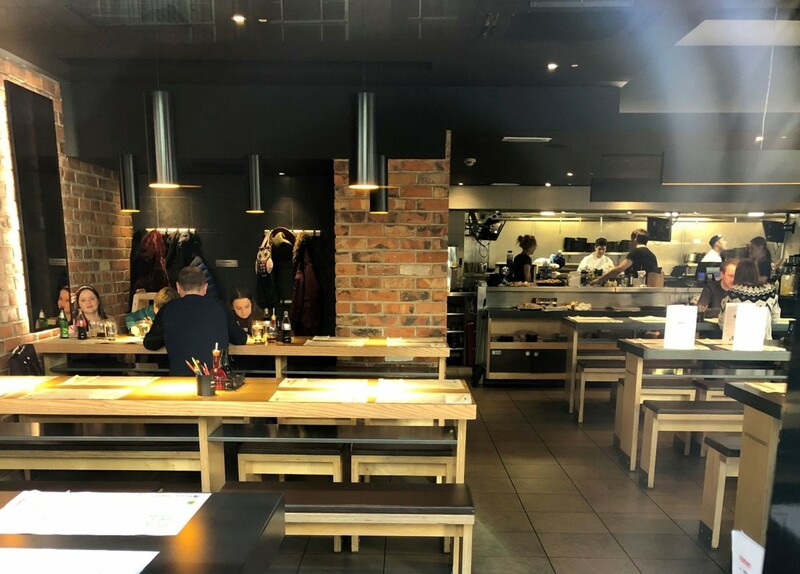 The buzzy atmosphere is always welcoming and there were a host of other multi-generational families enjoying spending time together over delicious food in a relaxed setting! 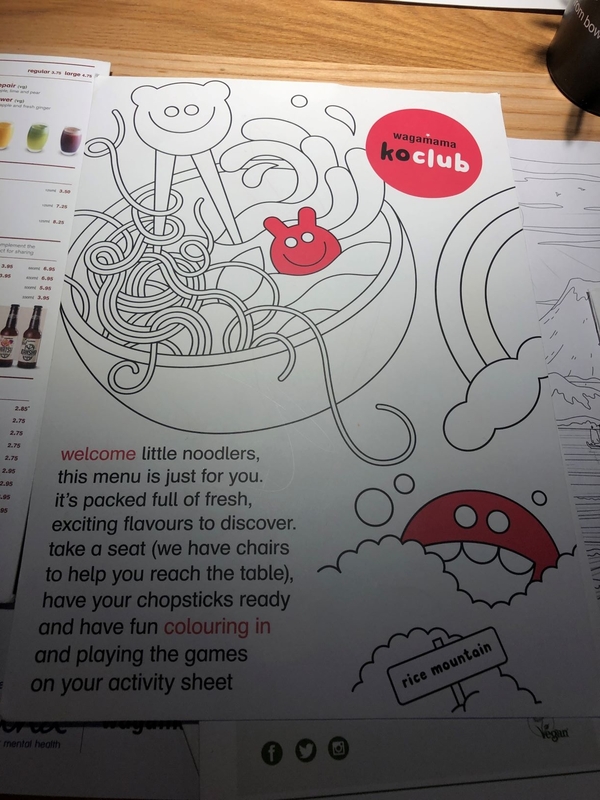 The kids menu is good value from £4.75 per dish and the plates packed with the rainbow of fresh food colours show instantly that there’s goodness in that there dish! 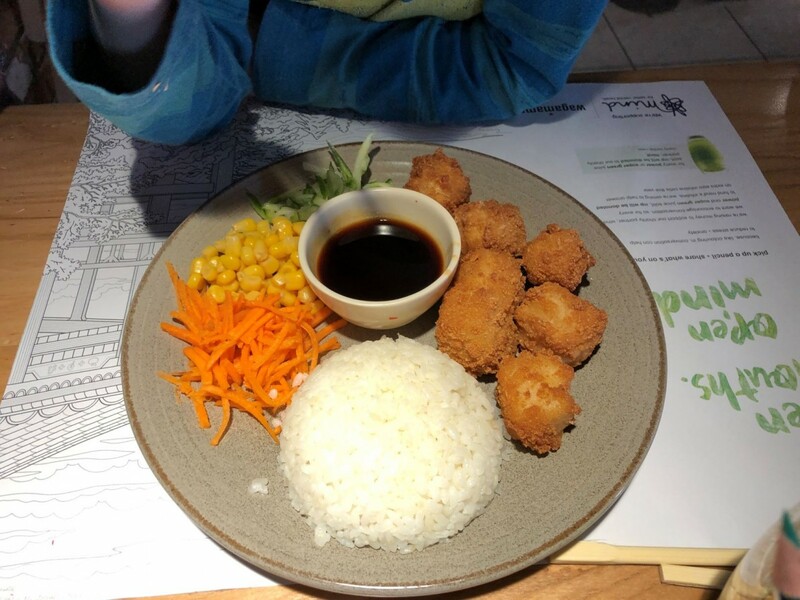 One of the big girls, chose the mini chicken katsu, which is chicken breast coated in panko breadcrumbs served with sticky white rice, carrots, cucumber and sweetcorn. She chose the curry sauce to go with it, though ended up preferring the amai sauce instead. She was over joyed with her choice and ate it so quickly, as it was cooked perfectly! It looked really good! 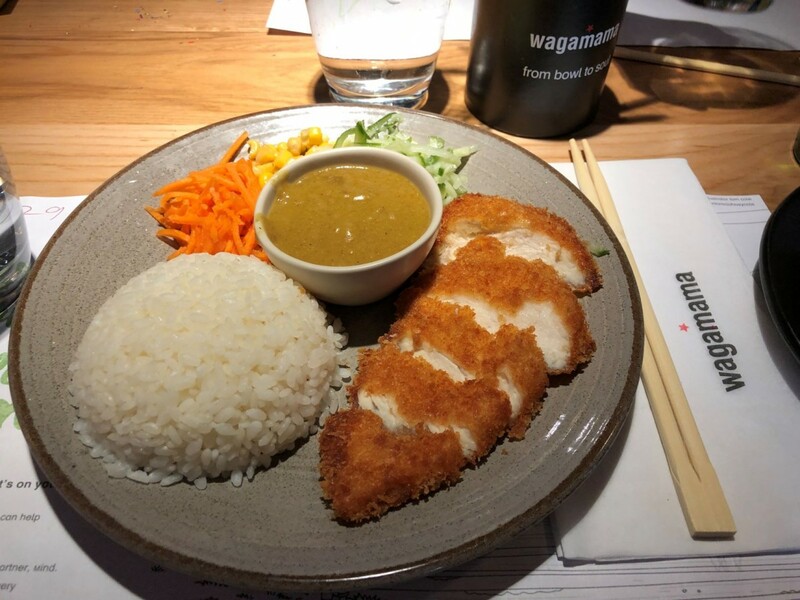 The Small Boy had been adamant that he didn’t want to go to Wagamamas as he ‘didn’t like anything there’ – luckily for us I knew he was wrong before we even arrived! And when we spotted the ‘cod chunks’ on the menu it was a quick sell to him of ‘would you like fish-fingers’ met with a resounding ‘yes please!’ and balance was restored. The cod cubes are also covered in crispy panko breadcrumbs, served with sticky white rice, carrot, cucumber and sweetcorn. He loved the cod, almost as much as he enjoyed using the kids chopsticks to eat it with. 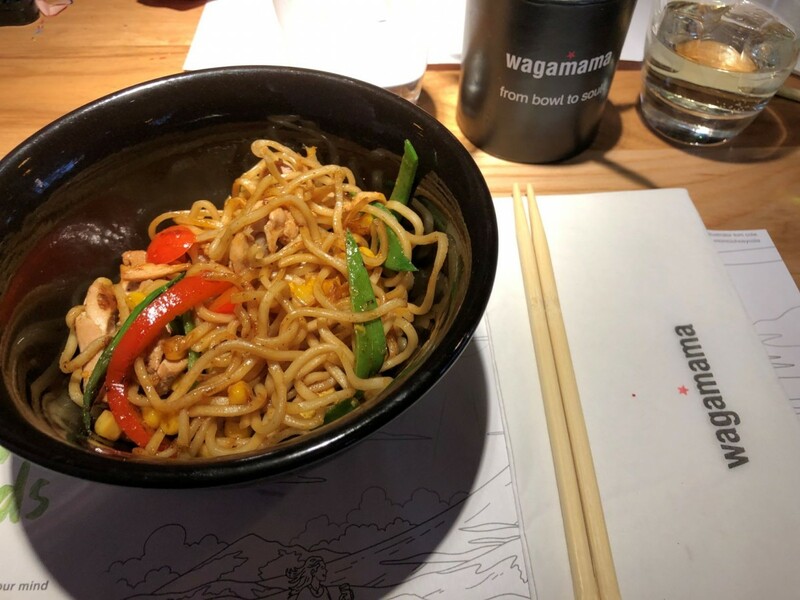 The other Big Girl LOVES her noodles and chose the Mini Yaki Soba with chicken ; which are teppan-fried soba noodles with chicken, egg, sweetcorn, mangetout, peppers and amai sauce. All her favourite things in one dish, and again all the rainbow of goodness! 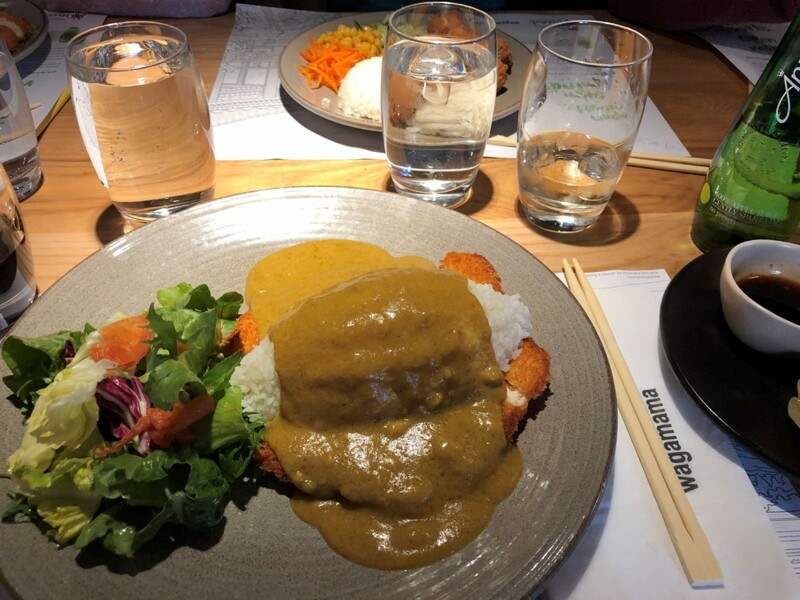 Harrogate Papa can always be relied upon to choose the chicken katsu curry, which is just the same as the Big Girls choice but served with a side salad. He loves it and it went down a storm! 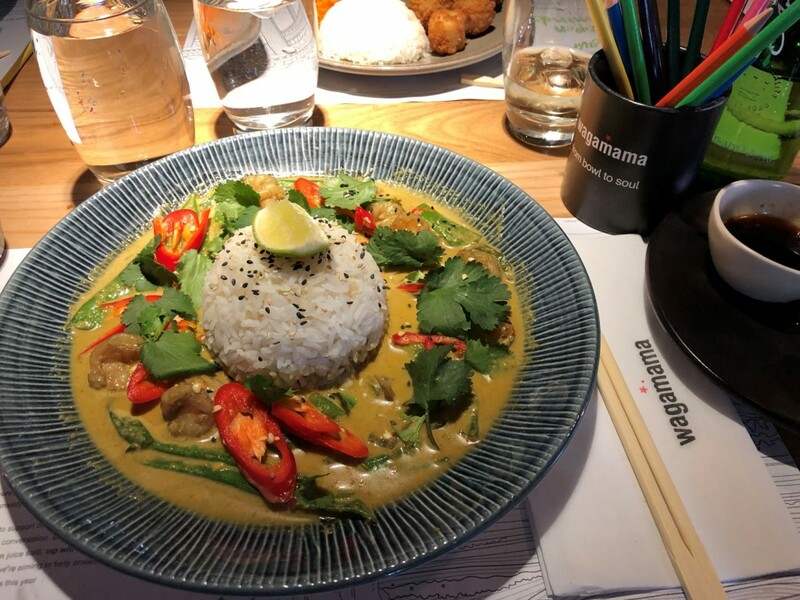 I like to mix it up when I go to Wagamamas and this time went for the Raisukaree – a mild coconut and citrus curry with mangetout, peppers, red and spring onions served with white rice, a sprinkle of mixed sesame seeds, chilli, coriander and fresh lime. I chose to have mine with prawns – which was really delicious and will definitely order it next time I’m in too. Just the right amount of spice, really creamy and all the crunchy bite still in the veggies! The Smalls all chose Vanilla Pod ice cream for pudding served with chocolate sauce, because, natch and at just £1.50 it’s a complete bargain! 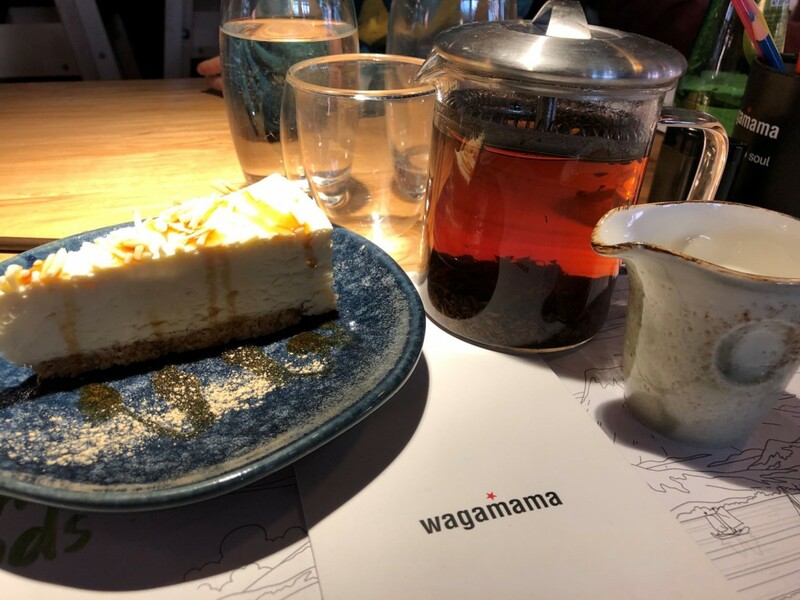 I decided on the white chocolate and ginger cheesecake, which was served with a chilli toffee and ginger sauce. It was really quite grown-up in flavour the ginger just off set the creamy-ness and it made for a really tasty dessert. 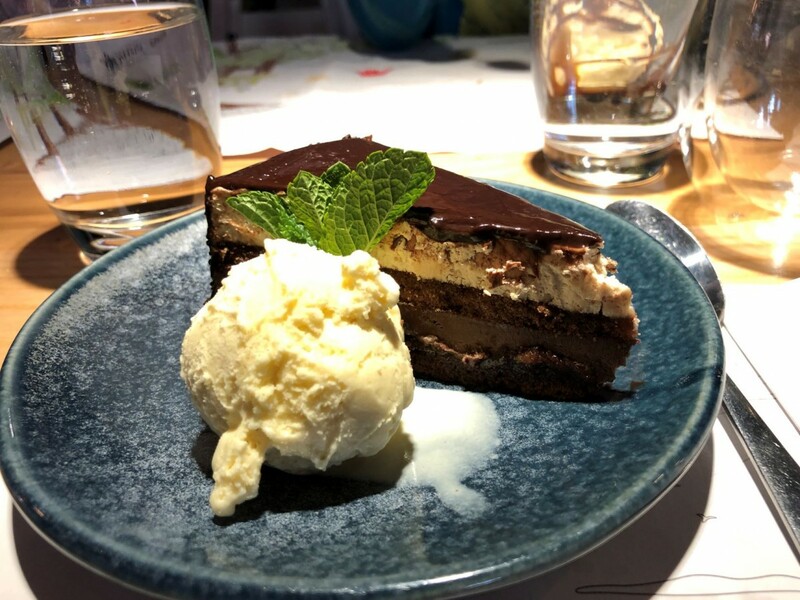 Harrogate Papa chose the chocolate layer cake, which was layers of chocolate sponge, dark chocolate parfait and hazelnut cream served with vanilla ice cream – which he shared with the Big Girls too! 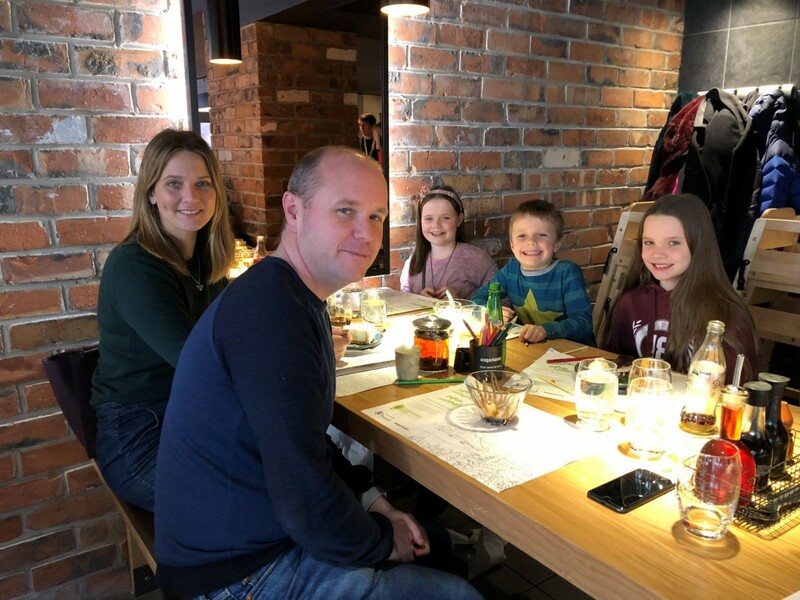 Overall we all loved our lunch in Wagamama Harrogate! Great service, atmosphere and setting. The food was top notch, we all ate everything on our plate (bar the carrots for the Small Boy) and it made for quite the alternative Sunday lunch venue. I love how you feel like you’re really nourishing your body with all the tasty and the Smalls don’t even realise they’re eating all the veg! We’re already looking forward to going back again! 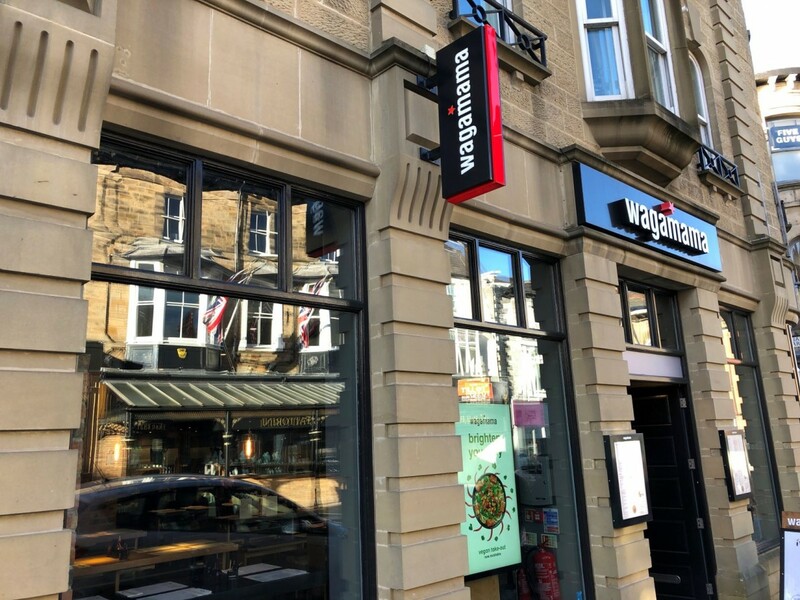 Wagamama Harrogate kindly invited us in to review with their compliments, the views, as always are my own.